He’s already posted notice of his talent via his Tour of Britain display, where he won a stage and finished second on two others behind Gerald Ciolek and Mark Cavendish respectively. 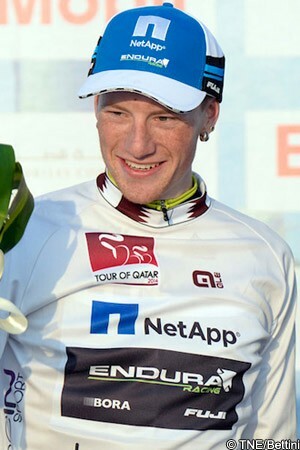 Now the 23 year old Irishman Sam Bennett has begun his career with the NetApp Endura team by earning the squad some podium time on stage one of the Tour of Qatar, finishing the day in the white jersey as best young rider in the 2.HC event. Bennett placed fourteenth on the stage to Dukhan Beach, crossing the line seven seconds behind the day’s winner Niki Terpstra (Omega Pharma Quick Step) and in the same time as the rider who led the bunch home, Tom Boonen. He was earlier third in the first intermediate sprint and the resulting time bonus secured there put him sixth overall and best in the young rider competition. As a result he will wear the pearl white jersey on tomorrow’s second stage. “It is nice to be on the podium,” Bennett told VeloNation this evening, speaking from the race hotel in Qatar. “I wanted to come here and try to do something. It is nice to get this jersey and hopefully something else will come out of the race. We will see how it goes. I don’t know yet what to expect - it is early days yet…it is only day one. Bennett admits that he didn’t get things right tactically during the stage, with a decision taken when the race was being buffeted by sidewinds causing him to use more energy than he could have. “I made some mistakes during part of the stage, as regards my position,” he explained. “I was trying to be clever in the second echelon [after the race had split – ed.] and to just sit at the back and conserve energy. It worked well for a little bit but when they went into one line, I was in the gutter and it was like trying to do a one kilometre pursuit. While a number of those in the race have already competed this season in events such as the Tour de San Luis or the Santos Tour Down Under, Bennett’s efforts today marked his first competitive appearance since last season. As a result he’s likely to be a little rusty when it comes to race efforts but, after the most solid winter season yet of his career, he’s quite satisfied with how he is going. Bennett rode the race once before, competing as part of the An Post Sean Kelly team in 2011. He had been injured in the months prior to the race and his training was sporadic as a result; this time round, he’s had a better buildup, and he’s also developed a lot as a rider. “The last time I was here, I was at the back before kilometre zero,” he said, comparing the two experiences. “It is a nice change to be able to fight a bit more. Today was much better than then, so we will see how it goes. “As regards what I’d like to do in the race, to get up on a stage would be really nice. That’s an aim. We don’t know yet how that will go. You have to be in the right moves and things have to go right for you in the final. For example, there were crashes in the finale today…you need to avoid all that and for everything to flow along well. As regards the best young rider competition, Bennett is aware that with a 10.9 kilometre time trial on stage three, he’ll need to pull out a solid ride against the clock if he is to continue holding onto the white jersey. He finished 22nd in the time trial at the Tour of Britain despite not pushing hard, having decided then to hold something in reserve in order to boost his chances of taking a stage victory later in the race. The result was a surprise to him, giving him confidence against the clock. That said, he’s aware that it is early in the new season and he is still building form. Before that TT, though, he has another stage to get through and he has a chance to solidify his slender lead. He’s got a one second advantage over the next riders in the best young rider classification. As a result, if things go to plan he’ll keep chasing bonus seconds in the intermediate sprints and also in tomorrow’s stage finish.